Roberta Brandes Gratz is an award-winning journalist and urban critic, lecturer and author. Her newest book is The Battle For Gotham: New York in the Shadow of Robert Moses and Jane Jacobs. Earlier works were the now classic The Living City: Thinking Small in a Big Way, and Cities Back from the Edge: New Life for Downtown. She is an international lecturer on urban development issues and former award-winning reporter for the New York Post. Ms. Gratz was appointed by Mayor Michael Bloomberg to the NYC Landmarks Preservation Commission in 2003 and in 2010 resigned from the commission and was then appointed by the mayor to serve on the Sustainability Advisory Board for PlaNYC. In 2005, in collaboration with Jane Jacobs, Ms. Gratz and a small group of accomplished urbanists founded The Center For the Living City. On November 5, The Historic Districts Council of NY (citywide) will honor her at the Four Seasons restaurant as their 2012 Landmark Lion. After Hurricane Katrina, Roberta bought a shotgun in the Bywater so she could get the story on the city’s rebuilding. She lives there half the year. 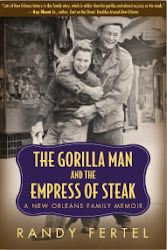 Q: Thanks for taking time out from your new book to talk about your experience in New Orleans. What would your hero Jane Jacobs appreciate about New Orleans as an urban environment? What changes have we made to our urban fabric that would she have deplored? A: She’d love the degree to which local people are involved in their own neighborhoods both working to rebuild them in positive ways and opposing inappropriate or disruptive changes when necessary. She’d also love the survival of corner stores and neighborhood shopping streets filled with pedestrian activity throughout the city, something all American cities used to have but lost. She’d deplore the refusal to reopen the patient-ready Charity hospital after Katrina and its oversize, suburban-style replacement at a location guaranteed to undermine the downtown and causing the unnecessary destruction of a solid working class neighborhood. She would also deplore the gratuitous tear down of all the public housing undamaged by hurricanes when so much of it could have been creatively reworked to be safe, economically integrated and appealing. She would recognize a contradiction in a city over-dependant on tourism yet not genuinely committed to protecting its architectural and cultural legacy. Q: Can you tell our readers the tale of how New Orleans defeated her arch-rival Robert Moses’ plan to build an interstate along the river on the edge of the French Quarter? Who were the heroes in that uniquely successful struggle? A: Local lawyer Bill Borah with the full backing of the Stern Foundation led that fight with a number of others willing to face down the biggest powers that be from New Orleans to Washington to make the right thing happen. New Orleans would have been destroyed by that highway, as so many American cities have been by similar projects. Q: Of course the downside to that preservationist victory was that the interstate was moved instead to the heart of Treme and a 2 mile double alley of glorious live oaks were cut down to build the elevated expressway. Treme as an African American business district along North Claiborne died a not-so-slow death. I’ve been a big proponent since Katrina of tearing it down (as they did in the Embarcadero after the San Francisco earthquake). What are the pros and cons of that teardown? And what do you think the likelihood of its being torn down? A: That is a myth. Moses original drawings show two roadways, not unusual for him. That idea, I suspect, has been perpetrated to purposely foster divisiveness. The taking down of the I-10 is as good an idea as it has been in the other cities where similar highways have come down. However, I don’t yet sense a real concern for the displacement of people that would result nor a sense that a replacement roadway would provide appropriate space for the significant cultural uses that now occur under the I-10. Until those local activities are provided for in a new design and until there is protection in place for the affected residents and businesses, full local support for this idea will not be forthcoming. It risks looking too much like a land grab. Q: “A crisis is a terrible thing to waste,” said University of Chicago arch-conservative Milton Friedman. HBO’s Treme seems geared up this year to explore the way developers made the most of things, not always in an above-board manner. Can you share some of that story, the way developers exploited our crisis? Are there telling examples of how sometimes they were stopped? A: I’m really looking forward to Treme’s treatment of this issue. The hospital and public housing examples are the most visible but all over the city structures have come down that shouldn’t have. Many have not only because of local watchdogs, particularly starting with Karen Gadbois and her blog Squandered Heritage that alerted the public to outrageous activities. That blog eventually led Karen and Arielle Cohen to establish The Lens, which has evolved into a fabulous investigative journalism outlet. Clearly the northern section of the Lower Ninth Ward would have been toast without vehement local resistance. Sadly, Treme is a current target of subtle and not-so-subtle developer exploitation with the feds aiding and abetting the process with the redevelopment strategy for the Iberville Houses. Iberville is a perfect example of the kind of quality that cannot be reproduced but could be upgraded, restored and added onto in order to create a dense, economically-integrated community. Q: Surely one of our biggest blunders post-Katrina is our handling of the medical corridor: the decision not to fix Charity Hospital (for $500mm) and instead to tear down 17 acres (?) of mid-city to build a new medical complex (for $1.4 billion). Is the LSU-VA/Charity hospital struggle comparable to the Robert Moses interstate fight? Care to weigh in on those decisions? Is there hope it won’t be as bad as some fear? A: This is a classic Robert Moses-era scandal, reminiscent of the Urban Renewal-style that was supposed to be behind us, as I wrote in detail in The Nation. This is especially tragic because of the quicker, cheaper alternative to modernize and upgrade the existing Charity that unnecessarily still stands empty. What a shot in the arm for all of downtown that would have been economically, to say nothing of the importance of the continued enviable hospital and teaching facility that is now history. It will be worse than is feared, as the lack of construction funds continues and the draconian cuts to the state’s entire Charity Hospital and health care system. It is dire, to be sure. The disrupted lives of a neighborhood can’t be calculated. Q: Can you tell us a bit about your forthcoming book? What went wrong in our return from Katrina and what went right? Who are some of your heroes in our rebirth? A: Ah, you’ll have to wait for the book for my view of what went wrong and right, aside from some of what I said above. That will be the essence of the story. I’m still very much in the information gathering and observation stage to give you conclusions. Q: When can we anticipate your book? A: I have been busy interviewing what will add up to hundreds of people. I have never ceased to be the newspaper reporter/investigative journalist that I started out as several decades ago which means my work is ongoing. Plan on 2015. Q: Tell us about your life in New Orleans? What have you come to like most about New Orleans? How’s the Bywater as urban environment? A: I love the warmth and friendliness of the people most of all. Urbanistically, New Orleans is unique and I am very much an urban person. The scale, diversity, culturally vibrancy and all the other obvious things are very appealing. The Bywater is a particularly friendly neighborhood. It has become increasingly popular with lots of local stores and restaurants opening. I love being a 15 minute bike ride from downtown. Sadly, I don’t think the city’s and transit authority’s next streetcar priority is St. Claude. This is so shortsighted. The city is more focused on tourists than on the resident and business taxpaying population that really keeps the city going. That mass transit access is the neighborhood’s real deficiency. © COPYRIGHT 2010 - 2011 Randy Fertel. Simple theme. Powered by Blogger.